NEW YORK--(BUSINESS WIRE)--Today, five participating schools – Fashion Institute of Technology, LIM College, Parsons The New School for Design, Pratt Institute, and the School of Visual Arts – sent two teams of five students to Amazon Fashion’s 40,000-square foot photography studio in Williamsburg, Brooklyn. Mentored by a group of top industry professionals, the student teams were challenged to conceptualize, style and shoot a captivating editorial campaign, with the winning images to be featured as part of Amazon Fashion’s Fall 2014 on-site editorial. The creative challenge required students to apply their skills in graphic design, styling, editing, fashion photography, and art direction, while working in their own dedicated photography bay. Industry experts – including Amy Odell, Editor at Cosmopolitan.com; Eric Wilson, Fashion News Director at InStyle; Kate Dimmock, Fashion Director at People StyleWatch; and Lori Goldstein, Fashion Stylist and Fashion Editor at Large at ELLE – served as mentors throughout the day-long competition, providing guidance and feedback to student teams as they worked to produce a campaign that speaks to the Amazon Fashion customer. Students were given access to state-of-the-art photography equipment, models, wardrobe, hair and makeup services, and props. YouTube beauty expert and entrepreneur Michelle Phan counseled teams on creating beauty looks that complement their campaign messages, using makeup from her namesake line, em Cosmetics. “We continue to be impressed by the student talent and industry support we see during our Studio Sessions competition, and we were thrilled to be able to host the challenge again this year. The students’ exceptional creativity and professionalism shine through in their beautiful campaign images. We know Amazon Fashion customers will be just as inspired by their work as we are,” said Cathy Beaudoin, President of Amazon Fashion. The challenge concluded with individual team presentations to a panel of Amazon Fashion executives including Cathy Beaudoin, President, Amazon Fashion; Dennis Leggett, Creative Director, Amazon Fashion; Gina Tovar, Fashion Director, Amazon Fashion; Muge Erdirik Dogan, Director, Amazon Beauty; and Darcy Penick, Chief Merchant, Shopbop, who selected the winning womenswear and menswear images. Each team was judged on wardrobe styling, composition, photography, art direction, set design, fashion editing, and their ability to compose a fresh and creative image that is consistent with Amazon Fashion branding. The School of Visual Arts’ womenswear and Pratt Institute’s menswear winning images will be featured on Amazon.com/StudioSessions, reaching Amazon’s 35 million fashion customers. A total of over $100,000 was awarded: each first-place team received $25,000 for their work and an additional $15,000 for their school; LIM College’s womenswear and Fashion Institute of Technology’s menswear teams were awarded the second-place prize of $10,000 per team. In addition, all team entries can be found on the Amazon Fashion Facebook page (Facebook.com/AmazonFashion) where the public will vote for the “Fan Favorite” to award $5,000 in Amazon.com Gift Cards to the winning team. Amazon Fashion, a fast-growing division of Seattle-based Amazon.com, Inc. (NASDAQ: AMZN), is a one-stop destination for head-to-toe style, offering clothing, shoes, jewelry, timepieces, handbags, and accessories from a wide range of iconic, designer, contemporary, and classic brands. Amazon Fashion aims to reinvent the online fashion shopping experience and to support Amazon.com’s corporate mission to be the Earth’s most customer-centric company, where customers can find and discover anything they might want to buy online. In true Amazon style, trying things on—and sending them back—is easy with free shipping and free returns on eligible items. At Amazon Fashion, we carry the newest and most-wanted pieces of the season, along with the classics and basics that make up the foundation of every wardrobe, including must-have denim from Hudson Jeans, True Religion, and Seven for All Mankind. Amazon Fashion also has one of the largest selections of shoes for the whole family, from designer to athletic, including favorite brands like Kate Spade New York, Steve Madden, Cole Haan, New Balance, Timberland, and so many more. Amazon Fashion also carries a vast array of handbags, jewelry, and must-have accessories—as well as an impressive watch selection, including GUCCI, Ferragamo, and Versace. From tried-and-true heritage brands like Levi's, Lucky Brand, and Pendleton to contemporary designers like Rebecca Minkoff, Rachel Roy, Steven Alan, and Tracy Reese, Amazon Fashion offers options for just about everyone. Amazon Fashion also provides how-to-wear-it ideas and style inspiration to make shopping that much easier and more enjoyable. Amazon Fashion editorials highlight the latest trends and newest arrivals, while designer spotlights and other special content take you behind the scenes with industry tastemakers. 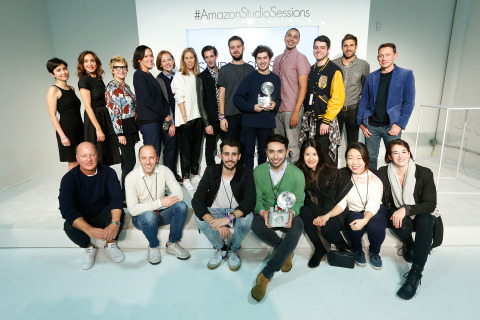 Awarding over $100,000 in prizing and the chance to be featured on-site, Amazon Fashion challenged rising stars from NYC's top fashion and design schools to create their best Fall editorial campaign.